Participants with their medals for entry into the finals gathered on stage for a group photo during the Scripps National Spelling Bee at Oxon Hill, Md., Wednesday, May 30, 2018. Participants with their medals came forward The final round took place on stage for a group photo shoot during the Scripps National Spelling Bee at Oxon Hill, Maryland, Wednesday, May 30, 2018. Abhijay Kodali, 11, of Flower Mound, Texas, reacts after spelling a word during the 3rd round of the Scripps National Spelling Bee at Oxon Hill, Md., Wednesday, May 30, 2018. Abhijay Kodali, 11, from Flower Mound, Texas, responded after spelling a word during the 3rd round of the Scripps National Spelling Bee at Oxon Hill, Md., Wednesday, May 30, 2018. Parents and supporters gather in front of the stage to photograph the winners of the medals coming to the final round of the Scripps National Spelling Bee in Oxon Hill, Maryland, on Wednesday, May 30, 2018. Parents and supporters gather in front of the stage to photograph the medal winners who reach the finals of the Scripps National Spelling Bee at Oxon Hill, Md., On Wednesday, May 30, 2018. Brody Dicks, 13, from Park City, Utah, spells "caudation" correctly during the 3rd round of the Scripps National Spelling Bee at Oxon Hill, Maryland, Wednesday, May 30, 2018. Brody Dicks, 13, from Park City, Utah, spells correctly "caudation" during the 3rd round of the Scripps National Spelling Bee at Oxon Hill, Md., Wednesday, May 30, 2018. 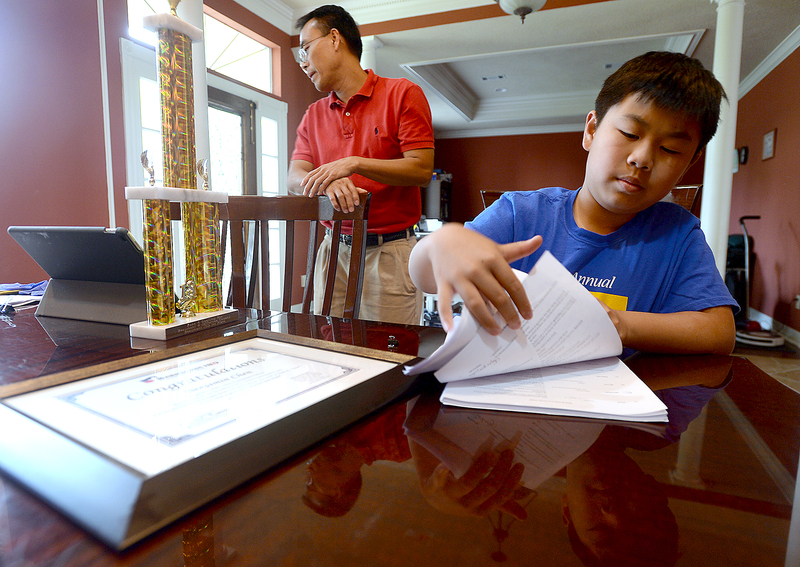 Caleb Xiao, 13, from Boiling Springs, SC, spelled during the 3rd round of Scripps National Spelling Bee at Oxon Hill, Md., Wednesday, May 30, 2018, "Gristility." Caleb Xiao, 13, from Boiling Springs, SC, correctly spells "Gristility" during the 3rd round of the Scripps National Spelling Bee at Oxon Hill, Md., Wednesday, May 30, 2018. Samantha Ho, 12, of Fredericksburg, Virginia, spells "Castle" during the 3rd round of the Scripps National Spelling Bee at Oxon Hill, Maryland, Wednesday, May 30, 2018. Samantha Ho, 12, of Fredericksburg , VA, correctly spells "Château" during the 3rd round of the Scripps National Spelling Bee at Oxon Hill, Md., Wednesday, May 30, 2018.